Working with our electric cooperative to transform our utility right-of-way into a pollinator corridor. I can state, with a high degree of certainty, that the famed Italian Baroque composer, Antonio Vivaldi, was not inspired by a utility right-of-way when he created his well-known violin concerto, “The Four Seasons.” Yet, while composing this article and looking over pictures I have taken of our right-of-way through the seasons, I admit to humming many memorable tunes from that musical masterpiece. On a map in the office of the Bath, Allegheny, Rockbridge Counties (BARC) Electric Cooperative, this small linear patch of real estate approximately 800 feet along Muddy Run Road in Bath County, Virginia, is just another nondescript segment of land defined by numbers on utility poles carrying a single phase line with 7200 volts of electricity; to me, it’s an oasis. Far from being a barren swath of weedy vegetation cutting through a forest, this right-of-way is aesthetically pleasing and supports a unique habitat of plants and wildlife. When a right-of-way goes through a forest, it creates an abrupt transition between the maintained vegetation within the right-of-way and the forest. Succession is a natural process in which successive stages of plants colonize the soil following a major disturbance, like fire. 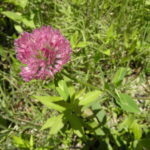 Pioneer species (grasses and herbaceous plants) are first to become established on disturbed land. After a year or two, pioneer species are overtaken by woody vegetation, including a sequence of trees starting primarily with conifers and ending with deciduous trees until a stable climax community is achieved (oak-hickory in the Appalachian forests where we live). 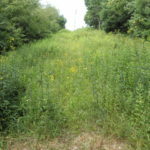 The vegetation within our right-of-way is repeatedly cut back and managed so that only early successional plants exist while the adjoining forest continues with its successional stages until it eventually achieves a stable climax community. The proximity of two plant communities representing different successional stages located next to each other is not common in nature; this indicates human intervention, as in the case of pastures next to forests. Sudden transitions between plant communities can occur naturally when there is a permanent environmental feature, including extremes in topography, like cliffs with a significant change in elevation. Lacking any natural physical transition, the sharp division of vegetation created by utility rights-of-way traversing through forests is completely dependent upon the actions of humans for its existence. Scientists know that “edge environments” between forested and non-forested land create steep gradients of wind flow, moisture, temperature, and sunlight between the open land and interior of the forest. I’m particularly excited that the utility right-of-way traversing our property is oriented west to east, bathing the south-facing side of the right-of-way in sunlight while plunging the north-facing side in shade. Ecologists note that in midsummer, south-facing edges may receive up to 10 times more hours of sunshine per month than the north-facing edge. This differential exposure to sunlight results in the south-facing side of the right-of-way supporting vegetation suited for an environment experiencing direct sunlight, drier and sandier soil, and rapid melt of snowfall. On the north-facing side, the environment supports vegetation more at home in the shade as soil moisture remains high through the year. Both Vivaldi’s concerto and our right-of-way experience four pronounced seasonal changes; each offers something for all of the senses. For the eyes, there’s a sustained eruption of wildflowers coloring the right-of-way from spring through fall. 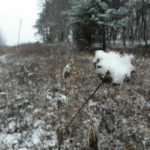 After the flower show subsides, dried seed heads of grasses and wildflowers offer interesting contrasts in textures and colors, their forms particularly striking when standing in snow. For the ears – bird songs, the call and response of insects, and the hum of pollinators. In the evening, chirping of crickets creates a hypnotic soundscape punctuated by staccato squeaks of a residential bat colony. In winter, especially in the still silence of a landscape blanketed by snow, an attentive visitor hears the rustling of dry vegetation in the subtle stirring of crisp winter air. 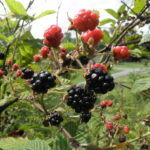 For the tastebuds, there’s a variety of edible plants to sample – greenbriar and wild asparagus in the spring, blueberries (high and low bush), blackberries, and elderberries in the summer. For the nose, there’s the pleasant smell of soil in the spring coming to life. Neuroscientists have discovered the soil bacterium, Mycobacterium vaccae, stimulates specific neurons in the human brain (the same cells targeted by Prozac) resulting in a marked improvement in one’s mood. Physicians in Japan prescribe visits to a forest for individuals as part of a stress management therapy called “Shinrin-yoku,” or forest bathing. Volatile compounds emitted by trees have been shown to have a positive effect on human health. A visitor to our right-of-way can experience these uplifting sensations simply by taking a slow and mindful walk along its serpentine path. For the sense of touch, a seasonal transformation of properties occurs in the vegetation and soil. 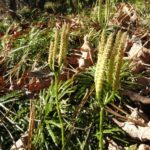 During the growing season, wildflowers cautiously emerge from the soil with soft and flexible stems before stiffening and undergoing fibrous reinforcement to face summer challenges. At the end of the growing season, leaves fall away, revealing seed heads atop withered stems. 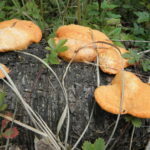 Similarly, the soil begins the growing season soft and moist before summer’s heat causes it to dry and harden. The winter’s sun rarely falls upon the hard frozen ground along the north-facing side of the right-of-way; yet thirty feet to the north along the south-facing portion of the right-of-way, the daily freeze-thaw actions on the soil result in a pattern of lifting and falling of the surface soil, producing an undulation of soil mounds wherever bare soil is exposed to the sun. Be aware; the distribution right-of-way described in this article does not happen naturally. Maintenance of a distribution right-of-way requires planning, work, and most importantly, an understanding of the potential electrical hazards present. It’s common for homeowners to plant a tree close to their house and claim they’ll prune the tree to manage its height only to later realize the tree has grown beyond their ability to prune or remove. In reality, one shouldn’t need to manage a tree’s height (size) if the tree has been properly matched to its site. The routine reduction of a tree’s crown is neither a cost effective, nor biologically sustainable, management practice for the homeowner. In situations where the tree does not match the site, the homeowner might give serious thought to replacing the tree with a more appropriate tree species. Depending upon the size of the tree, a homeowner may call in a professional tree care company staffed with Certified Arborists recognized by the International Society of Arboriculture to perform the work. 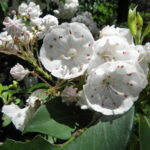 It is also a common for homeowners to contact their electric cooperative to request that their right-of-way be placed on the company’s no-spray and limited removal/pruning list without fully appreciating the capacity of the vegetation in, and around, the right-of-way to grow aggressively. Unlike the rest of a home’s landscape, the majority the trees “volunteering” to grow in the right-of-way are inappropriate for that site. Furthermore, the homeowner will find that the options for managing trees that have grown close to the electric lines in a distribution right-of-way are severely limited because of the electrical hazards present. Failure to properly maintain the vegetation in a right-of-way can result in several outcomes – none desirable. 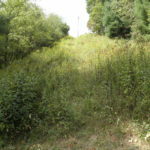 An overgrown right-of-way will eventually result in vegetation bringing down a power line resulting in a power outage for everyone receiving their electricity downstream of the failure. A downed power line presents a very dangerous situation because it sends electricity through the ground and conductive objects (chain link fences) that may cause fatalities to those who come in contact with the electric current. [Note: Stay at least 30 feet away from any downed power line.] A downed power line can also start fires if it contacts combustible material. Overgrown vegetation also makes it more difficult for the utility lineman to repair the downed power line. 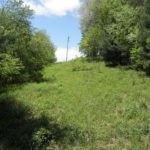 If the utility company has to return to the property to reclaim the management of the right-of-way, they may resort to similar land clearance practices used when the right-of-way was first established. These outcomes add expense for the utility company and customers as utility line clearance work is typically the most costly operating expense incurred by utility companies. Utility companies hire specially trained contractors to implement vegetation management strategies – often a combination of pruning, removals, mowing, and herbicide applications. 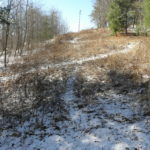 Where possible, the intended outcome of vegetation management is to encourage a low-growing plant community to provide environmental benefits (prevent erosion, mitigate storm water runoff, support wildlife, etc.) while helping to compete against fast-growing trees that threaten the overhead lines. It’s easier to achieve the desired goal if the vegetation is managed on an annual basis; utility companies extend their management cycles to multiple years in order to balance the cost of vegetation management with the ultimate goal of providing reliable and safe electric service. If you’re interested in managing the vegetation in and along your right-of-way, arrange a meeting with a representative from the electric cooperative involved in right-of-way maintenance to discuss how your proposal fits with the utility company’s expectations and responsibilities. Consider asking the utility company to proceed with the removal of trees that will be perpetually pruned so that you can replace them with a more appropriate species to better support the goals you hope to achieve. For example, we asked for the removal of a large black cherry and sugar maple located on the border of the right-of-way to provide additional light for the shorter growing scrub oaks, hawthorns, and elderberries. Removing trees along the edge of the right-of-way that will eventually threaten the utility lines not only helps to decrease the likelihood of power outages, but also helps the utility company save money on pruning. 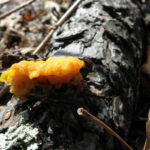 Colorful saprophytic fungi digesting a black cherry log (September 1, 2014). 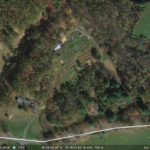 The most important step in the process of managing vegetation in your right-of-way is planning. There are three equally important issues to decide in the earliest stages of planning: first, state the purposes of the spaces making up the right-of-way; second, plan for access for yourself, the utility company, and their contractors; and finally, decide how you will manage the vegetation to achieve the standard vegetation height restriction and width requirements on your right-of-way. A right-of-way may consist of multiple smaller spaces, each with a unique purpose. Once the purpose for each particular space has been determined, future decisions on desired plants and maintenance will be easier. Draw a map of your right-of-way and include the areas immediately around the right-of-way (roads, lawns, forests, drives, etc.) to help you envision access routes for you and representatives from the electric cooperative. Explore your right-of-way and make a list of all the activities for which it may be used. After you have created your map and generated a list of possible activities for different areas in your right-of-way, talk to someone knowledgeable about vegetation in your area to see if your plans are feasible. Now you’re ready to contact a representative from your electric cooperative to share your ideas about the future of your right-of-way! For the area of the right-of-way photographed for this article, the purpose was fourfold: first, to provide habitat for pollinators; second, to provide an opportunity for leisurely strolls when walking to the mailbox; third, to observe wildlife; and finally, to harvest blackberries, blueberries, and elderberries. 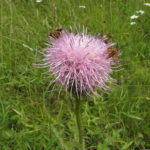 Planning for the pollinators proved to be relatively easy since wildflowers emerge naturally over time. 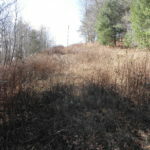 To assist in the establishment of the desired wildflowers we removed competitive vegetation and avoided year-end clearing until after the flowers dispersed their seeds. For leisurely walks we laid out a pathway in a serpentine manner to observe the diversity of plants in the right-of-way and for access to the berry producing shrubs. The serpentine path also enables visits to the plants along the south- and north-facing edge environments. On a summer day we can observe prickly pear, yucca, and blackjack oaks basking in full sun in parched sandy soil on the south-facing side of the right-of-way before the path takes us into the cool shade of the north-facing side inhabited by mosses, ferns and dogwoods comfortably at home in the moist, loamy soil. To improve our chances of observing wildlife, we created habitat by leaving dead branches and logs on the ground as well retaining standing dead trunks with heights low enough to avoid any threat to the utility lines. Early in the planning process it’s important to consider how workers will maneuver equipment in the right-of-way to access the utility infrastructure and, if needed, prune trees and remove incompatible vegetation. Discuss potential access routes with the representative from the utility company during your face-to-face meeting. Include these potential access routes on your map and only allow annual, biennial and/or non-woody perennial plants to grow in these areas. When deciding what type of vegetation will grow in the right-of-way we decided to work primarily with native compatible vegetation with respect to maximum growing heights. We’re fortunate that the seed source for vegetation in, and around, the right-of-way is as varied as the weather conditions and animals capable of delivering seeds. Our earliest efforts involved removing incompatible vegetation we could safely perform while staying a safe distance from the utility facilities. Trees that required properly trained utility line clearance arborists to remove were tagged with ribbons for removal the next time our right-of-way is scheduled for line clearance work. 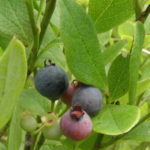 A commitment was made to dedicate the greatest amount of time and energy removing invasive plant species including Japanese stiltgrass, oriental bittersweet, Japanese honeysuckle, autumn olive, Japanese barberry, multiflora rose, and crownvetch. 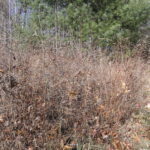 As everyone with experience battling invasive plant species knows, we will never truly “control” these invasives but the time and effort needed to manage their attempts at spreading has already been greatly reduced. Early in the planning process we made the decision to manage the vegetation in the right-of-way without the use of herbicides. As a consequence of this decision, we ended up at an outdoor power equipment store seeking the advice from a professional regarding power trimmer recommendations for right-of-way vegetation management. The sales representative recommended a professional model trimmer that allows for different cutting attachments. I can’t emphasize enough the importance of having the right piece of equipment for the task of managing vegetation. Working in your right-of-way should be enjoyable, not a chore that you dread; otherwise you should abandon the project and hire someone else to perform the work. Most importantly, whenever you are working in your right-of-way, be mindful of safety. Do not perform any procedure that is unfamiliar or places you in a situation that can cause an accident, from either the equipment you are using or from getting too close to the overhead electric lines. In addition to being a good steward of our land, we are also playing a part in improving the environment of my community. 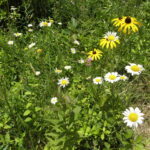 Since distribution rights-of-way exist all across the US, there’s a wonderful opportunity for property owners to have a significant impact as they manage invasive plant species, improve water quality, decrease storm water runoff, improve the welfare of pollinators and improve air quality, on a national scale!